Congratulations on entering this great event for this Saturday, April 2, 2016. We are happy you can join us for our 31st annual run. Youâ€™ve signed up for a challenging and beautiful run. 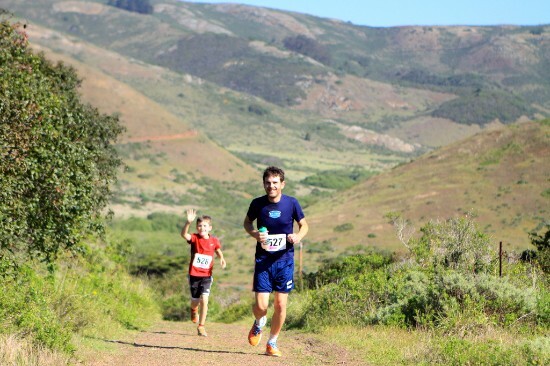 As you reach the summits of this course, you'll take in a view of San Francisco Bay tucked behind the rolling green hills of the Marin Headlands to the east and looking west you will view the Pacific Ocean. You'll start and finish at the historic parade ground at Ft. Barry in Rodeo Valley. Along this scenic trail run through the Marin Headlands, you'll soak in panoramic vistas of the Golden Gate Bridge, the San Francisco Bay and the lush Pacific shoreline peppered with vibrant wildflowers. The course is a combination of single track hiking trails and fire roads. 8:50 am: Pre-race announcements at the race start. 9:00 am: Marathon starts approximately at this time. 9:10 am: Half Marathon starts approximately at this time. 9:20 am: 10K starts approximately at this time. Post Race: Runners are encouraged to hang out after the race to enjoy our spread of snacks and share stories from the course. You will pick up your coveted t-shirt after you finish the race. Course will be marked with orange ribbon. Aid stations will be located at miles 5 & 10 for half marathoners, 5, 10, 13, 18 & 23 for marathoners. There are no aid stations on the 10K course. We highly recommended that you carry your own water bottle. The 10K course is a single loop. The Half Marathon is a larger loop. The Marathon does the Half Marathon loop twice. There will be snacks, water and Gatorade at the finish. There is a 6-hour course wide cutoff (this represents a 13:45 pace for the Marathoners). Jogging strollers are not allowed. HEADPHONES AND AUDIBLE MUSIC OF ANY TYPE ARE NOT ALLOWED! Runners using headphones or audio music will be disqualified. Sorry, no dogs on the trails. Take the first exit north of the Golden Gate Bridge (southbound Hwy. 101 drivers take the last exit before the bridge). Conzelman Rd. will be the only road going uphill within sight of the freeway. Turn right onto Conzelman. Follow this road until it forks at McCullough Rd. Turn right onto McCullough. At the bottom of the hill, turn left onto Bunker Rd. Follow Bunker Rd. for approximately one mile to the large parking lot on the right. When you arrive on race day, we will have parking attendants directing you to the parking areas. Please pay attention! Especially if, you have run this race beforeâ€¦you may go on auto-pilot and head to the old parking lot area which no longer exists. Be sure to allow yourself 10 minutes to get to check-in from the parking area. If you have any questions, feel free to reply to this email. Copyright Â© 2016 Enviro-Sports, All rights reserved.